INSTAGRAM HAS UNVEILED a new long-form video feature in a bid to attract “creators” like those on YouTube, as it announced that it now has more than one billion active users. IGTV will enable any user to upload long-form videos and will also include channels from video creators, similar to a format employed by Google-owned YouTube which has given rise to a number of YouTube stars. 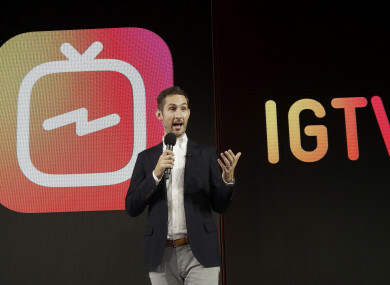 Systrom said IGTV is built to be used on a smartphone and boosts the time for videos from the previous limit of one minute. He added that IGTV is “built for how you actually use your phone, so videos are full screen and vertical”. According to the research firm eMarketer, 181.7 million Americans will watch video content on their smartphones at least once a month this year, up 6.1% from a year ago. Product manager Ashley Yuki told the event that IGTV “is an open platform from day one, so everyone can become a creator”. Systrom described the new app as “a separate space, a dedicated space to enjoy video without being distracted”. Facebook acquired Instagram in April 2012 for a combination of cash and stock worth some $1 billion (about €864,805,000) at the time. While Facebook offers no detailed revenue breakdown, eMarketer estimates Instagram will generate $5.48 billion (about €4,738,638,200) in net US ad revenue this year, up 70.4% from last year and accounting for more than one-fourth of Facebook’s net mobile ad revenue. Email “Instagram launches new long-form video service to compete with YouTube”. Feedback on “Instagram launches new long-form video service to compete with YouTube”.